Both floors of Marc Greenfield’s office are curated like a museum, its walls adorned with paintings, photographs and murals by friends, colleagues and other local artists. Outside, the only piece by a non-Rhode Islander rises over the cars and street. The piece, which covers an entire exterior wall of the building, is “Misty Blue,” a new mural by LA-based artist Andrew Hem. It is a project sponsored by the Avenue Concept, a nonprofit committed to supporting and developing sustainable public art in Providence. Yarrow Thorne, the organization’s founder and artistic director, had been eyeing the location for about five years. It was prime real estate for a mural: a large exterior surface, flat and visible. Greenfield has owned the building for just about two months. 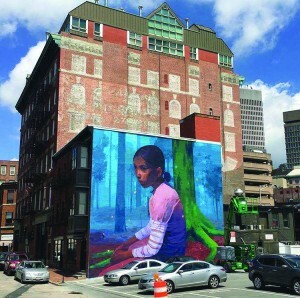 Thorne explained that the city of Providence approached the Avenue Concept about a collaboration, a mural, completed in time for PVDFest, which took place in early June. The Avenue Concept had already reached out to Hem and secured him as the resident artist for the summer. The original mural Hem had in mind was a two-figure piece, which evolved into a one-figure mural. After seeing a photograph of the location where the mural would be situated, he wanted to create a nature scene, with greens and blues to contrast the red brick around it. His inspiration, he said, came from stories his mom told him about her time in the jungle during the Cambodian genocide. Hem is Cambodian, and he said that after he heard about Providence’s significant Cambodian population, he wanted the mural’s subject to be Cambodian as well. “For me, I definitely feel like it was one of my favorite murals that I’ve done,” Hem said, noting that something “clicked” for him while he was painting that has him excited about his future murals, as he feels he learned about colors and applying his methods to large spaces. To complete the mural in time for PVDFest, the timeline of his work had to be significantly moved up. The original location selected for the project had fallen through, and Thorne was searching for a new place to house the mural. Enter Greenfield and the building at 118 Orange Street. Greenfield has long been a supporter and patron of the arts. He points to field trips and family trips to museums, as well as family members with interests in the arts as the genesis of what has been a lifelong love for artwork. Greenfield said the project was completed in about three weeks. All told, murals like this one can take months to complete, as fundraising, preparations and other work leading up to the project are set in motion and completed before work on the piece can begin, Thorne said. For Greenfield, his interest in the project, after he was approached by Thorne about using the building, was immediate. Having art in the workplace is something important to Greenfield and something he has incorporated into the two offices he’s had in his 25-year law career. The pieces have moved with him to his new office, including the first piece he ever purchased: a work titled, “Nefertiti,” by Alfred DeCredico, whose work makes multiple appearances throughout the office. “I feel it’s the right way to have my work environment,” he said. Hem, similarly, is a student of many types of art forms, and said his style is a result of being inspired by a variety of influences, including nature, anatomy and architecture. “I like street artists and I like academic artists,” Hem said. “You have to have an interest in a lot of things … to be truly original,” he said, noting that having singular influences can limit an artist’s scope. Moving forward, Greenfield has plans to light Hem’s mural to maximize its visibility. He and the Avenue Concept have been collaborating on this front, and meetings have been convened to discuss options and plans. The mural is located downtown, near the Red Fez, on the corners of Orange and Friendship Streets.